Oh hey, Amy. Well, no I haven't forgotten about you. And yes, I'm still working on the time machine. It's been a bit tricky to fix, shall we say. Yes, I'm quite aware you keep dreaming about coming back to the 21st century. I'll make it happen, that's for certain. (Probably) Do not despair! In the meantime, tell me how it's going in 1950-something. How's your waitress job at the diner going? I'd say server but no one in the 1950s would know what I was talking about. Hmmm. Well, it does look quite busy. But you know what they say: "An honest day's work is an honest day's dollar" which sounds totally appropriate for the 1950s cause that's probably what you actually earn in a day. And if we're being truthful, you must admit that you haven't worked hard in your life before now ... ever. Also since we're being truthful, the years of the 1950s are lively, fun, boisterous, romantic, and booming - so I can only assume you're also having some fun. There's rock and roll! There's romantic doo-wop! There's innocent necking in cars (kissing, Amy, kissing). And there's lots of dancing. You're going to a sock hop? Tonight? With a few of the other waitresses? Well, there you go. What did I tell you. 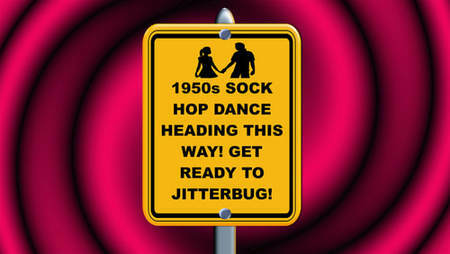 Normally held in high school gymnasiums, Sock Hops became popular in North America starting in 1948. Because the floors of gymnasiums are made of varnished wood, it's important to protect them from the hard soles of the shoes worn at this time, so dancing in socks is the perfect resolution. Of course, as you know, this will no longer be an issue in the future with the popularity of soft-soled running shoes. Not sure what to wear? How about a poodle skirt? Oh yeah, no, I totally did not say a poodle in a shirt. Okay, have fun at the Sock Hop. Can't wait to hear what you thought of the music. 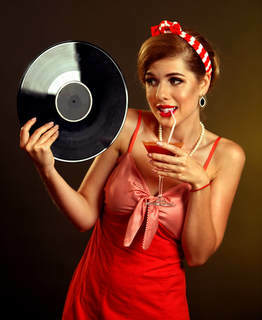 Have fun dancing to vinyl.